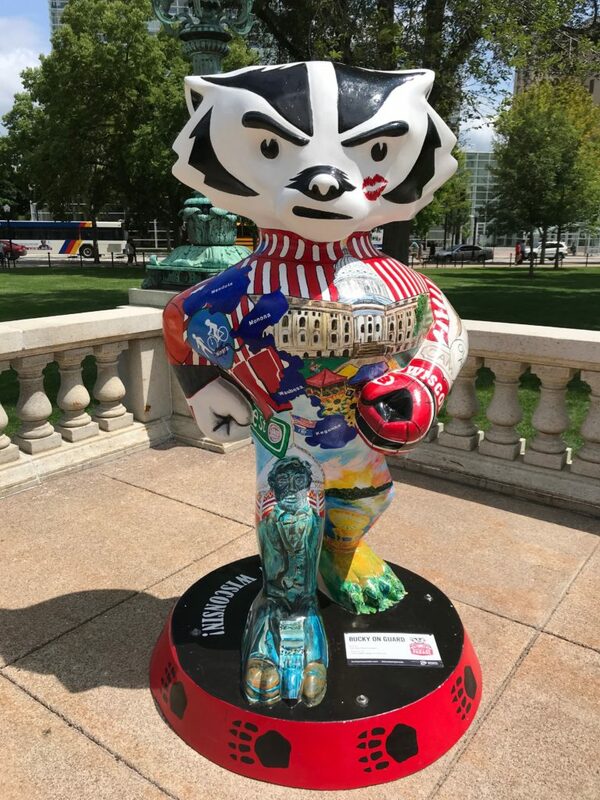 A cool, partially cloudy day motivated me to track down the Buckys at the Wisconsin Capitol. 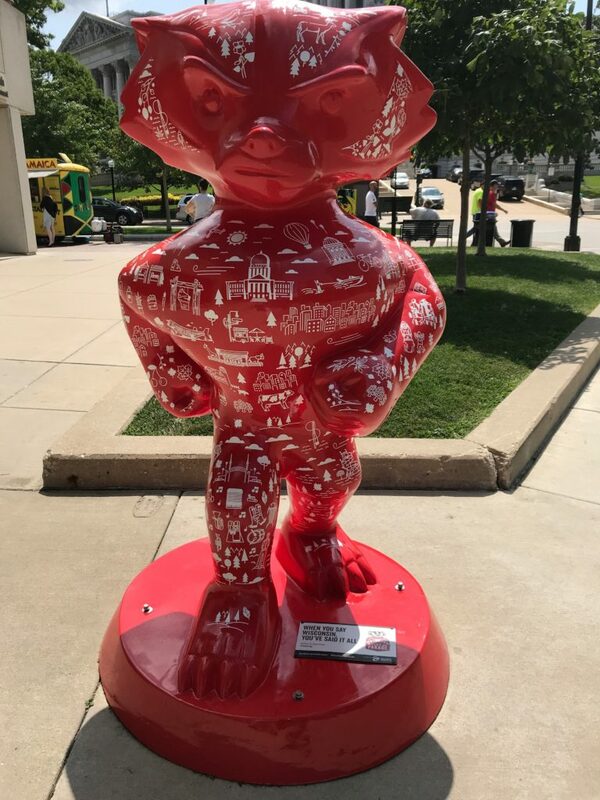 I swung into a parking space on the square, plugged the meter and started my quest. 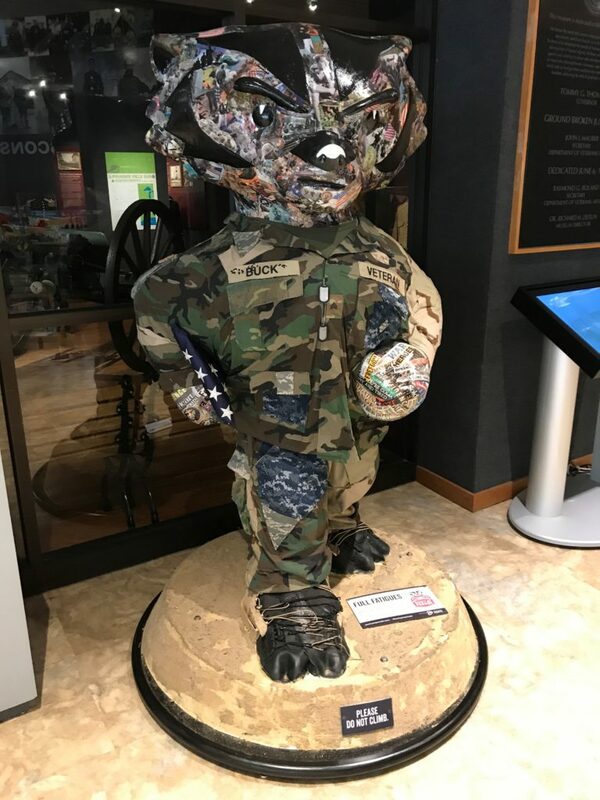 “Full Fatigues” Bucky at the Veterans Museum represents every branch of the Armed services with his fabric collage created by veterans. 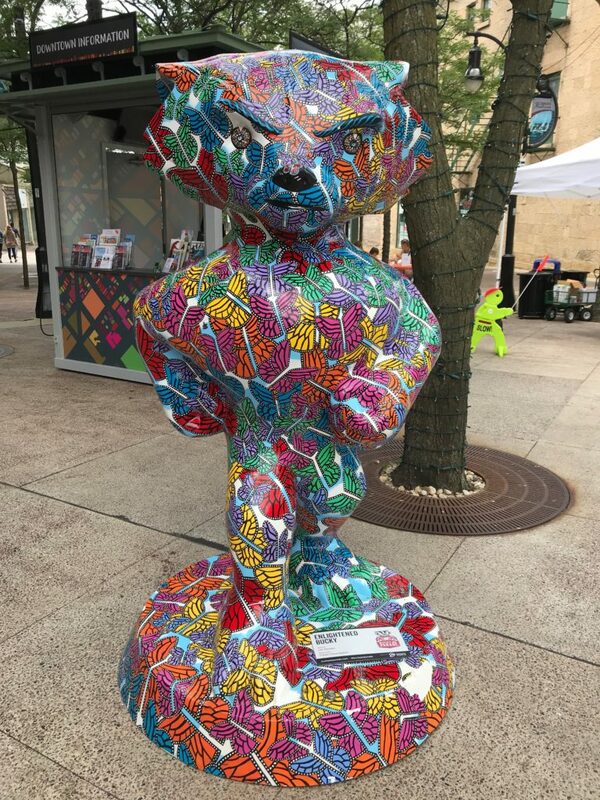 On State Street, “Enlightened Bucky,” covered with butterflies, represents enlightenment. 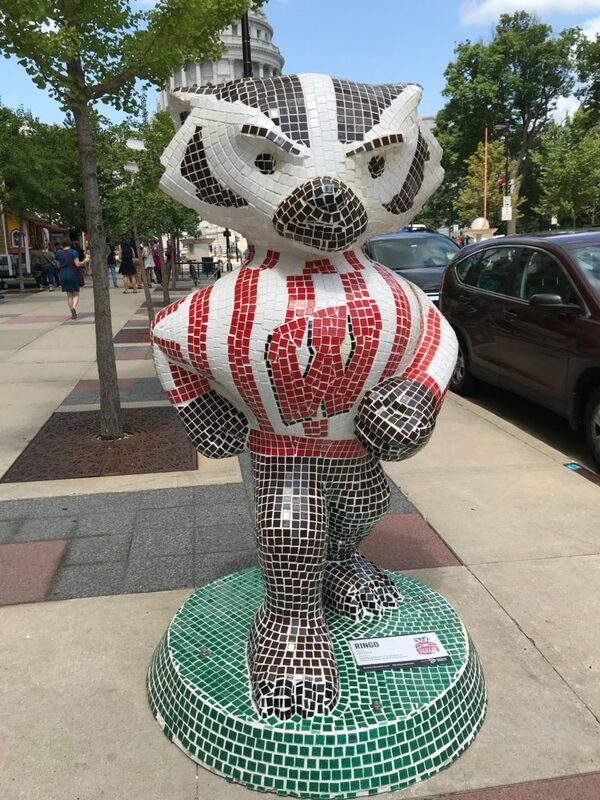 Across the street, “Razzle Dazzle” Bucky reflects the sunlight like a disco ball in his armor of silver sequined fabric. I nodded. He pointed. 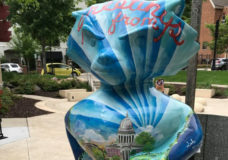 “Well if you walk that way, there are a couple of Buckys and then you continue around the outer rim of the Capitol. After that you go around the inner edge and there’s more Buckys.” His plan turned out to be good advice. 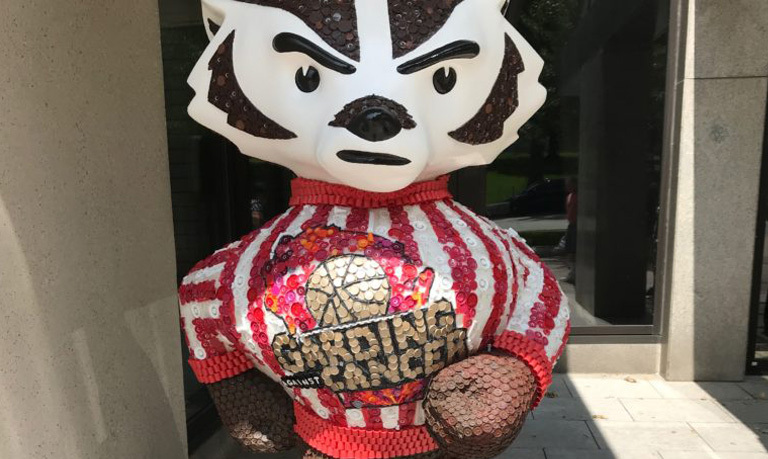 Caps from medication vials blanket “Vial Caps For The Cure” Bucky with “Garding Cancer” emblazoned across his chest. 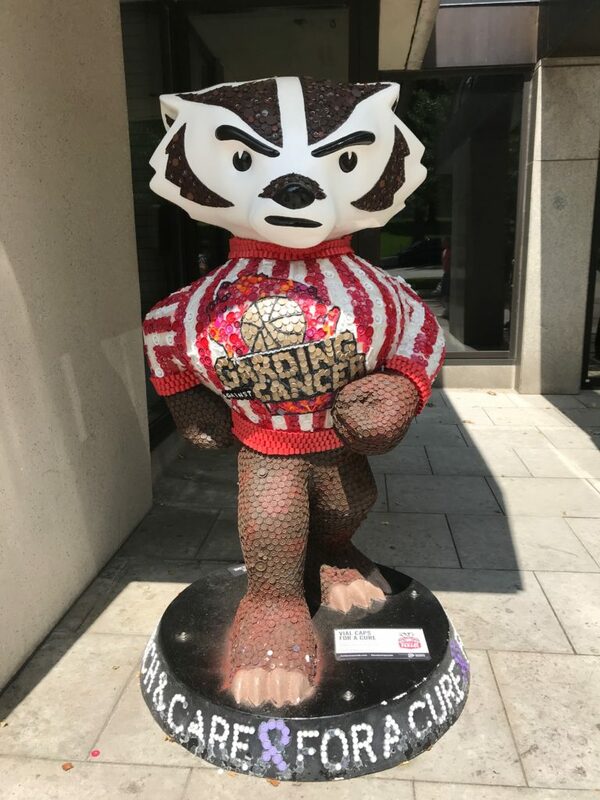 UW basketball Coach Greg Gard and his wife founded Garding Against Cancer in honor of his father who passed away from brain cancer. 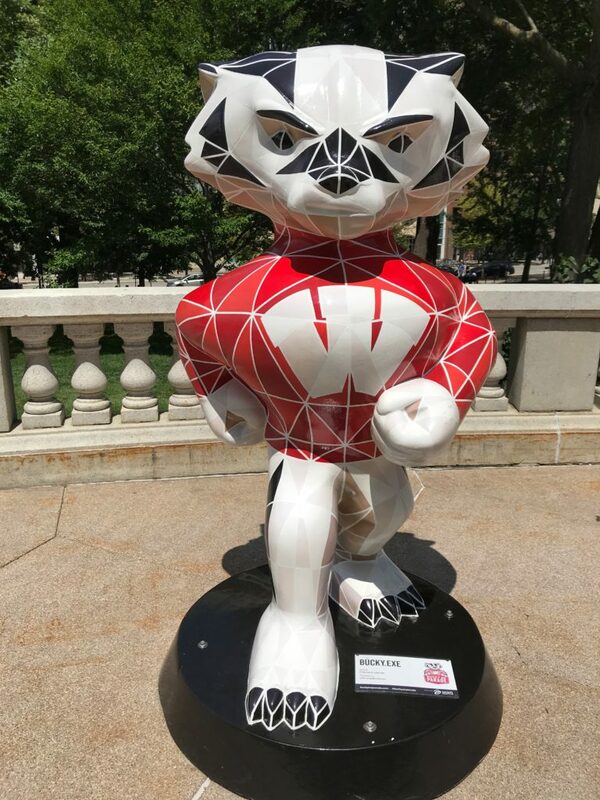 It is one of the charities that will receive the proceeds from the Bucky auction. 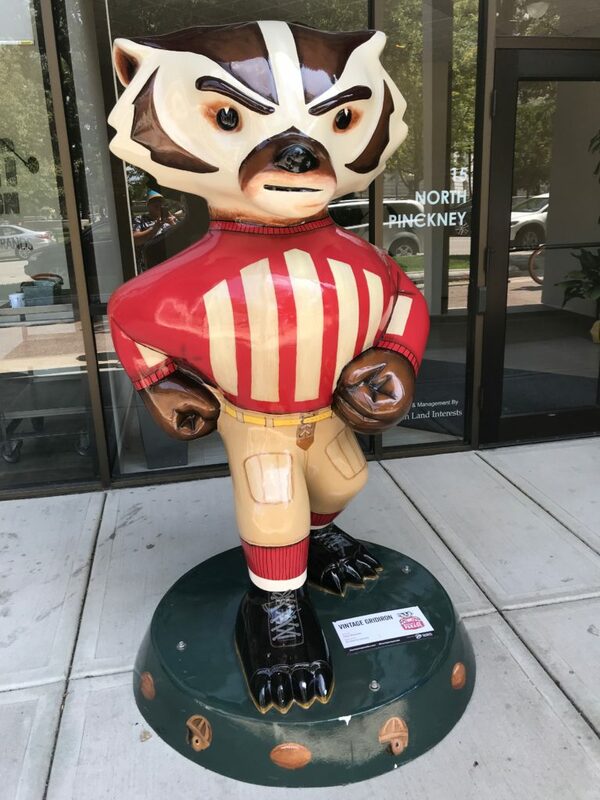 “Vintage Gridiron” Bucky sports a 1920’s style football uniform. 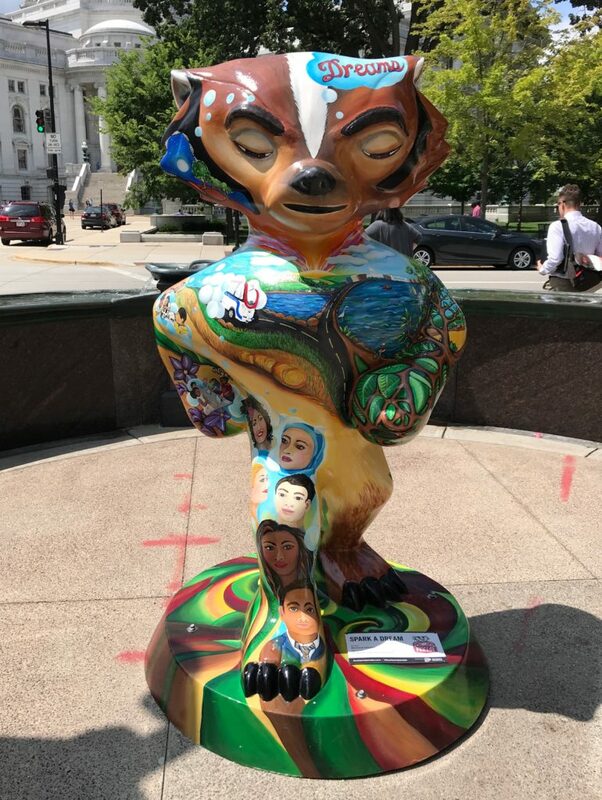 “Spark A Dream” Bucky represents our diverse population pursuing their dreams along the various Wisconsin pathways. 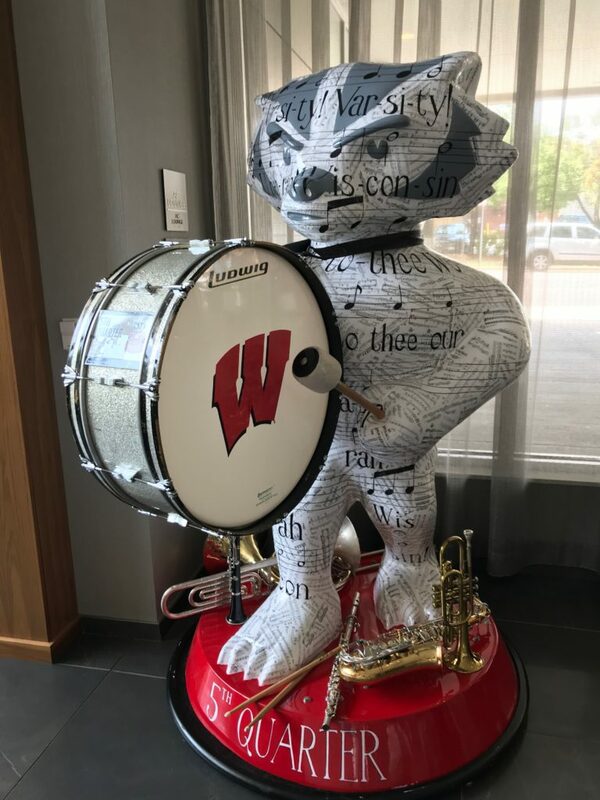 In the lobby of a nearby hotel, “5thQuarter” Bucky, decoupaged with sheet music and surrounded by real band instruments, marches with the UW band to the beat of his drum. 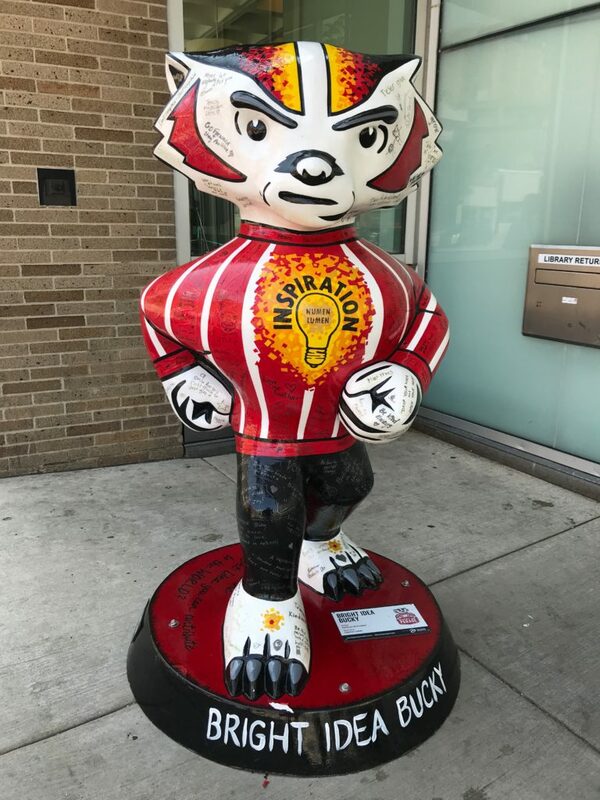 With a peck on the cheek, “Bucky On Guard” embodies Madison traditions and landmarks including a huge wedge of Wisconsin-shaped cheese emblazoned on his back. 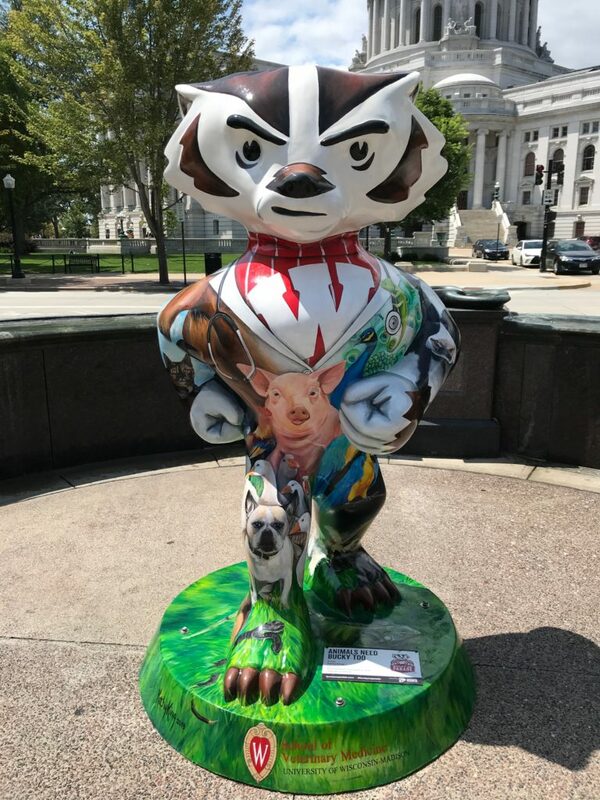 The artist of “Ringo” Bucky dedicated his creation to a close friend nicknamed Ringo, a former UW hockey player with stage 4 cancer. 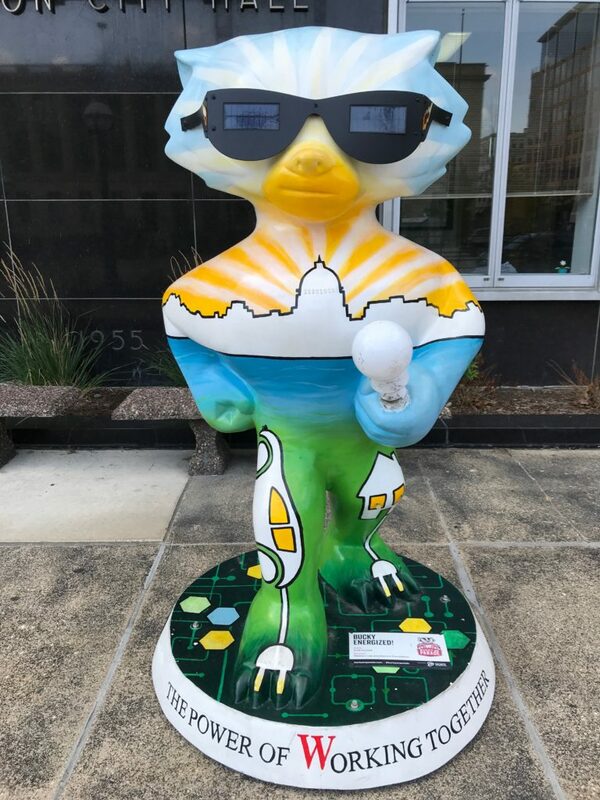 “Bucky Energized” represents sunshine, solar and electric power. 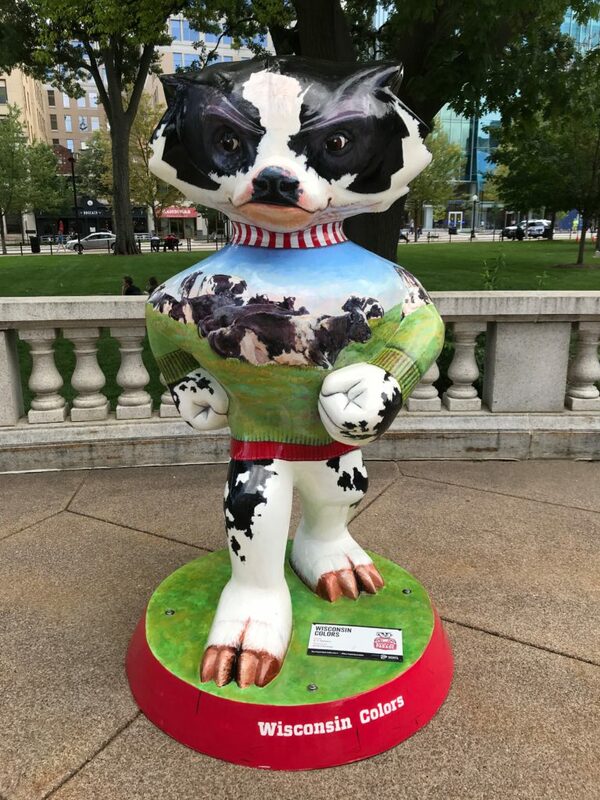 Black and white cows graze in green pastures on “Wisconsin Colors” Bucky, a Wisconsin map stamped on his forehead. 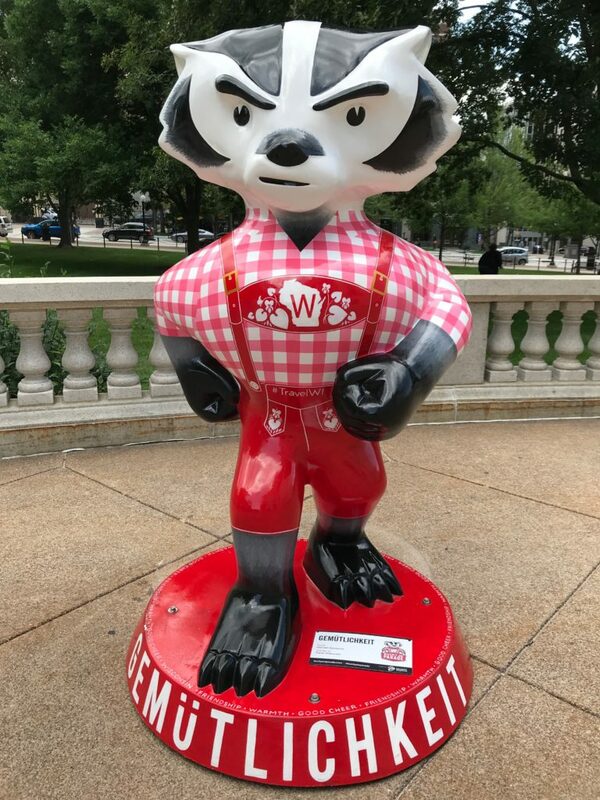 Dressed in Badger lederhosen, Bucky “Gemütlichkeit” encourages friendliness. 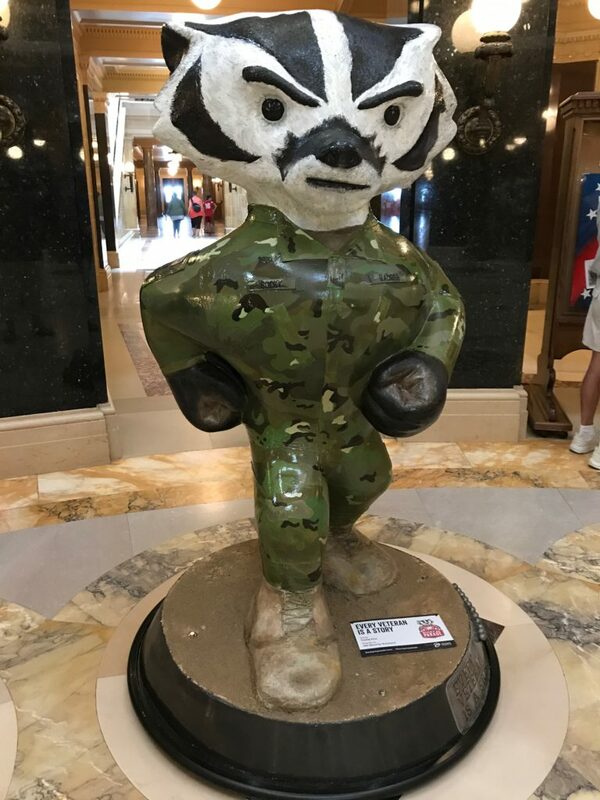 Inside the Capitol, “Every Veteran Is A Story” honors our armed forces and includes a real patch from a member of the 101stAirborne Division. 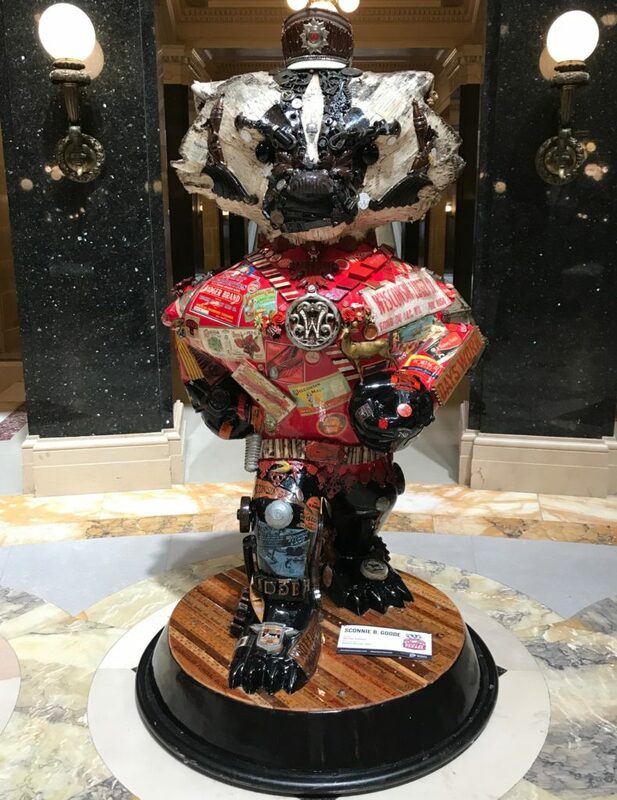 Across the rotunda, a nautical wheel, nuts, bolts, timepieces and town labels related to tourism, dairy and manufacturing decorate “Sconnie B. Goode” Bucky referring to a Chuck Berry song. 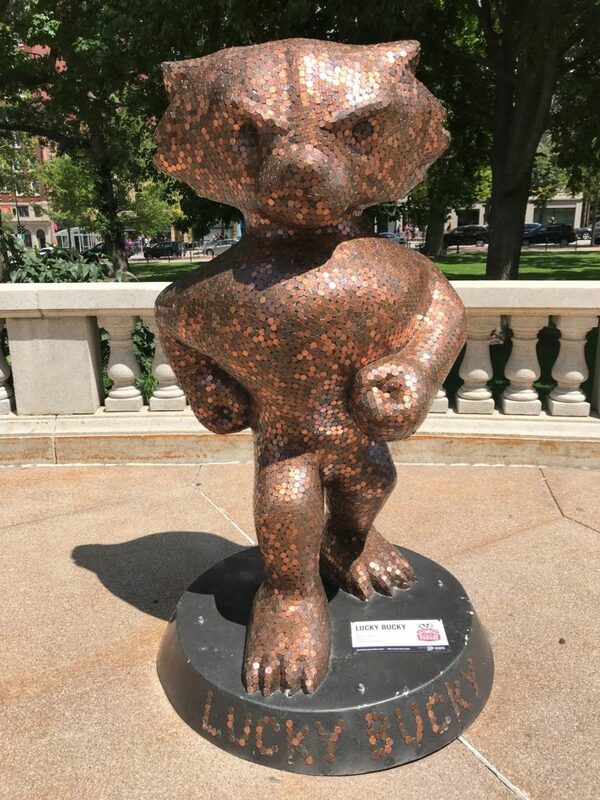 With so many exits, I checked my map to find the correct door leading me to “Lucky Bucky” composed of 11,759 heads-up Lincoln pennies. 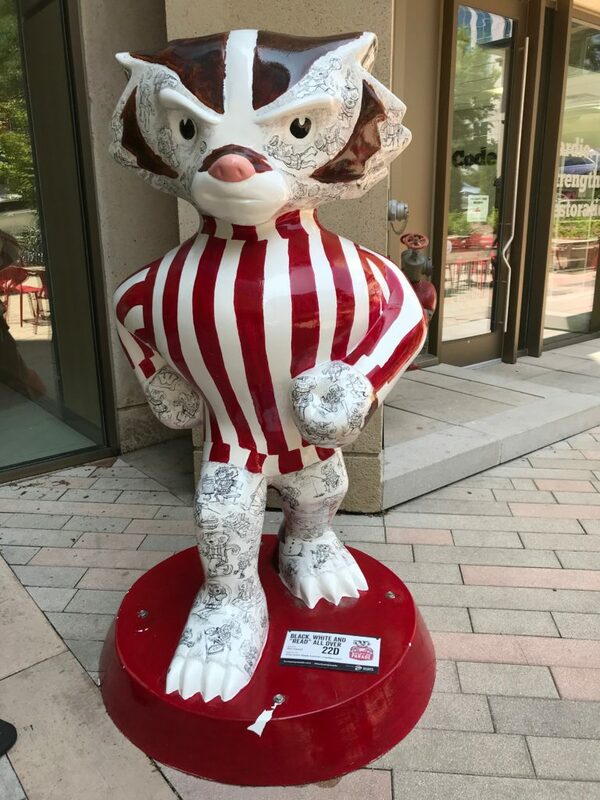 But can you find the four tails-up designs: wheat, Union shield, Lincoln Memorial, Lincoln bicentennial, 2009? 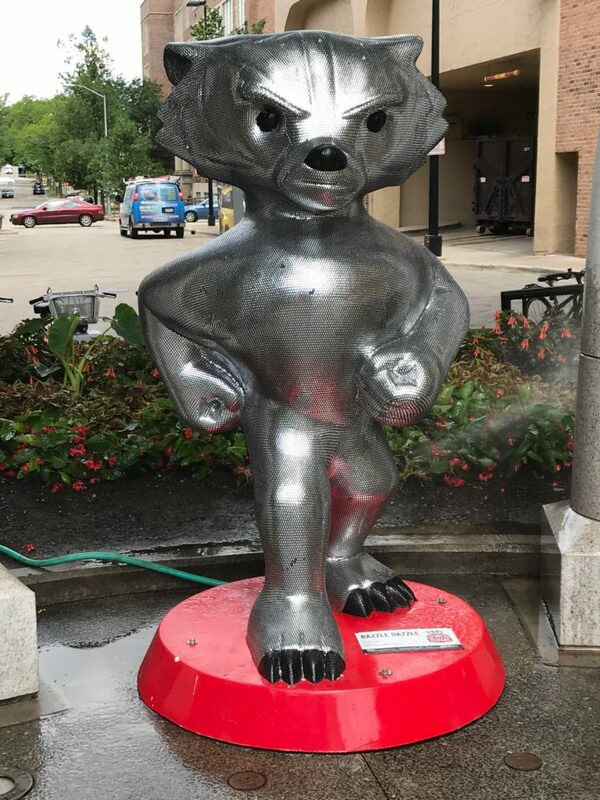 Onto “Bucky. EXE” painted in a grid of triangles. I wonder what computer file he is ready to execute. 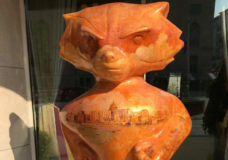 Once again, I examined my map to verify that I had tracked down each of my intended Buckys. 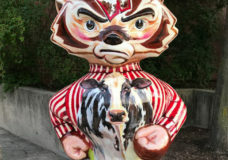 But I had overlooked one. 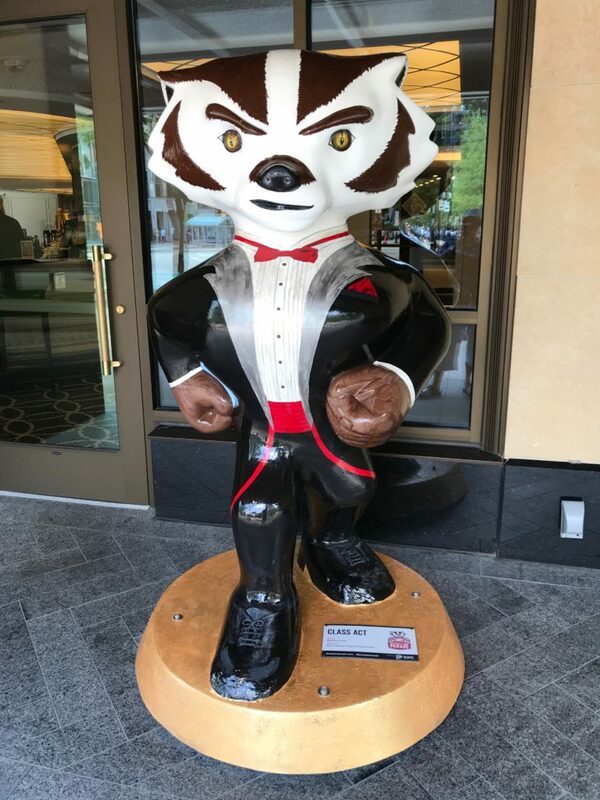 I backtracked to “Class Act” Bucky decked out in his tux for a night on the town. 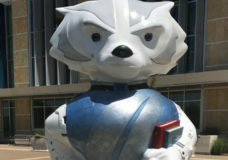 I walked toward the library, setting my sights on “Bright Idea Bucky” representing new ideas. I pulled into one more place, hit my flashers just as another car pulled in behind me and followed suit. The previous week, road construction had hindered this stop. 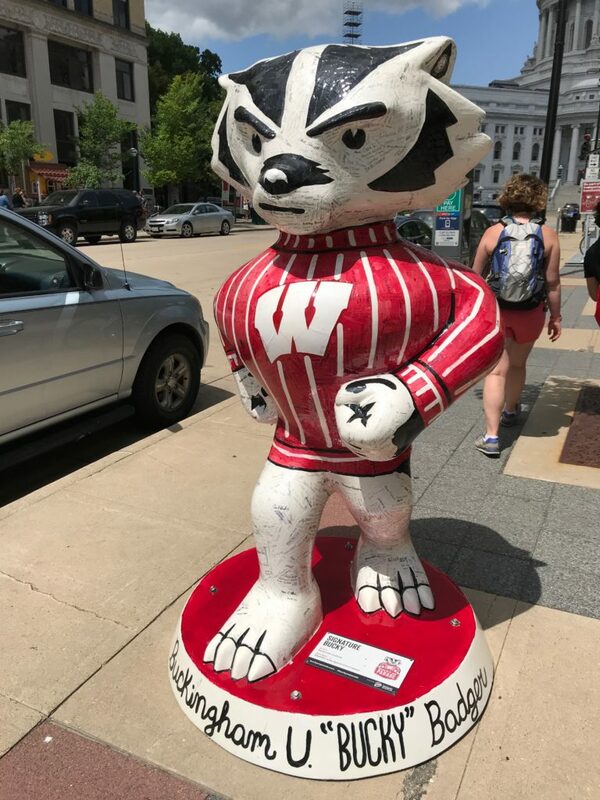 We drew near “Black, White and ‘Read’ All Over” Bucky, his chest puffed out in his red and white striped sweater etched with Bucky cartoons featuring Wisconsin sports.